Strong sound with clear articulation - for consorts, larger ensembles and recorder orchestras. Easy-to-speak high register - this bass is also convincing as a solo instrument. Try out Baroque sonatas or alto recorder duets with this instrument; its warm, deep sound lends them a unique charm. 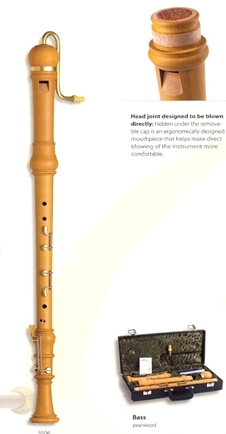 Head joint designed to be blown directly - hidden under the removable cap is an ergonomically designed mouthpiece that helps make direct blowing of the instrument more comfortable. Pleasantly clear sound - speaks easily. Resilient & reliable - due to the choice of wood & robust, practical design. Relaxed holding position - due to the well-balanced weight distribution, light construction and slender, economical design. Comfort Tenor - makes playing easy: two additional keys reduces the stretch between fingers. The bent neck brings the instrument close to the body relieving stress on the arms. Complete with thumbrest & neck strap.